Ashkefardic Nite brought a large and enthusiastic crowd of students together for a festival that featured music, customs, stories and FOOD from the many lands in which Jews have lived. The program underscored that despite our many differences we Jews are one family, and no matter how we make it the food is delicious! The night kicked off with a musical Havdalah ceremony - with both Sephardic and Ashkenazic melodies. Participants then enjoyed over thirty delectable dishes originating from all over the world, with background music from many world regions. Students told their families' stories, many participants took advantage of the henna booth as well. The guys enjoyed a night out on the town bowling and doing some good ol’ fashioned male bonding. Lounge Nite was a hit with ferocious competition and yummy pastries and chocolate fondue- who needs to go downtown on Thursday night? The students of Chabad under the aegis of the Barry Raff Maasim Tovim Foundation pay visits to residents in local facilities for the aged as well as patients in the local hospitals. They also bring food and good cheer to their fellow students who are laid up in bed when ill. Pictured here are the students during their Chanukah visitations to the area nursing homes. is not for the faint hearted! It all begins with massive shipments of boxes containing legos arriving to Chabad. It takes scores of hours on the part of dedicated students (during the last week of classes in the face of finals and papers) , lots of patience, a great attitude and a certain genius to build a safe, viable Menorah out of 3,500 pieces of lego. Think you want to try this at home? Are you up to the task? BU is lighting up for Chanukah with the thousand points of light campaign that made sure every Jewish student at BU had a Menorah and candles, plus a dreidel and chocolate gelt. Students distributed over 1000 free Chanukah kits throughout the campaign. Through the freshly falling snow they came—by the droves—to enjoy hot bagels and shmears, omelets, pancakes, coffee and more. How else to celebrate another night of Chanukah and take a break during finals week? It was the perfectly delicious and fun way to end a wonderful semester! Despite final papers and exams hundreds of students gathered to celebrate Chanukah in style with a Menorah lighting ceremony, delicious latkes, donuts and hot cider and a special performance by the Crosbys. It wasn’t just a conventional Menorah that was lit; this Menorah was built of thousands of pieces of lego! It was later dismantled and repacked to be distributed by the NY based Chai Lifeline organization to children with cancer along with over 4,800 worth of toys that were collected in a month log toy drive that led up to Chanukah. Students on the West Side enjoyed a back-to-school open house at Chabad of the West Side, featuring a sushi buffet and a chance to greet friends. Challah baking workshops with Hadasa have become a favorite event at Chabad! Participants learn about the Mitzvah of Challah; mix, knead, shape and bake their own loaf of deliciousness to take home! Over 40 students attended the first Challah Baking Workshop of the Spring semester which even featured a special demonstration of flour grinding from the wheat kernels. Many of the students enjoyed eating their very own Challah on Friday night at Chabad. Israeli Music group rocks the House! 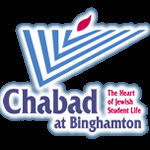 Binghamton brought the month of Adar in with style! Simply Tsfat, the unparalleled music group from the city of Tsfat in Israel, performed in what can only be called an explosion of talent and joy. They literally rocked the house with their original melodies and singular musical style and got everyone on their feet and dancing. Participants in Chabad’s annual ski trip enjoyed perfect conditions and each other’s company. What a way to welcome in the “Spring” semester! No better way to welcome the joyous month of Adar than with Salsa dancing, Ice Cream Sundaes and Female Bonding! There is nothing sweeter than triangular cookies filled with assorted scrumptious fillings unless it’s the act of making those treats with good friends and plenty of laughs plus the knowledge that a portion of the treats were going to be distributed to Jewish patients in the hospital and the elderly in facilities and homes. A winning combination—only at Chabad! “The Whole Megillah” took on new meaning at the spirited Megillah reading at which hundreds enjoyed booing Haman and the power point production that made the story come alive. An original and witty Purim Shpiel performed by a talented cast had the audience in stitches! What a way to begin the holiday. One of the main themes of Purim is unity and friendship. The students of Chabad , under the aegis of the Raff Maasim Tovim foundation visited area nursing homes , reading the megillah, bringing Mishloach Manot and bringing the holiday spirit to appreciative residents. Multiple Megillah readings were staged at Chabad and on campus throughout the days so that the greatest number of students could fulfill the important mitzvah of listening to the reading of the Megillah. And for the Jews at the Chabad Purim Feast there was light and joy plus Chinese Food, L’chayims, Music, Dancing and more fun than can possibly be described. It was truly an unforgettable evening. While the carnival was rescheduled due to a Blizzard that had Broome County in a state of emergency, it lacked for nothing! A huge crowd showed up to enjoy the rides, attractions, contests and food. The costumes were great, the spirit was amazing and the Mechanical Bull was absolutely wild. Over $3,000 was raised for relief efforts in Haiti through Magen David Adom. Go Binghamton!